Chester County's most trusted source for local real estate information. Find homes for sale in Downingtown PA all from one spot. If you are new to the area and would like a personal tour of Downingtown Real Estate call Drew Heasley @ 610-761-1602. Downingtown PA is zip code 19335 and is located in Chester County PA. Downingtown School District has always had a reputation for being one of the best in the state but with the addition of the STEM Academy the demand has hit record highs. Downingtown Real Estate has always done well and homes in neighborhoods that have recent cosmetic updates sell fast and for 95+% of list price. DHS East and DHS West students can apply for Downingtown's STEM Academy. Downingtown offers downtown living as well as properties with plenty of acreage. Looking for a home in Downingtown with a pool? Need a first floor master? If you are looking for something specific but cannot find it email at DrewHeasley@KW.com or call 610-761-1602. West Chester PA is considered to be one of the best places to live. Most of the houses in this town are located among trees and miles of beautiful countryside, but the most interesting thing about them is that they are within easy access to several major highways, recreational activities, shopping centers, health facilities and entertainment centers. Homes for sale in West Chester PA have many amenities that allow you to enjoy and have fun in your own home. The homes in West Chester give you the small town atmosphere with everything that you could expect to find in a big town. What’s more, this town is boarded by several big towns that are just a few miles away. Whether you are looking to invest in real estate or a home to live in, West Chester has it all. The amenities of the homes varies with each individual facility, but most of them include basic indoor amenities, such as a balcony, central air, washer and dryer, high speed internet, fireplaces, and wall-wall carpeting. If you are looking for real estate for sale in West Chester PA, there are certain things that you need to know as you start your journey of purchasing a new house. It’s always advisable to look for a real estate agent or company that has a reputation to maintain. Find an agent that you feel comfortable with and have confidence in. the realtor you choose matters a lot as he or she is the one that is going to guide you in your journey of buying a new home. Arrange for a meeting with several agents before choosing one. It is the job of your realtor to help you and advise you on every step of the way but it’s always wise to do your own research. Your agent will always advise you and tell you about the most recent repairs that have been done to a specific home but it’s up to you to decide whether you want to buy the house or not. I would be happy to recommend a local lender. It’s very important that you get pre-approved for a mortgage before you begin your search for a new home. This will help you to gauge yourself and know the types of houses that you can afford to buy. In addition, it’s wise to have an approximate amount of the type of house that you are looking for. You will discover that a three bedroom house in one place might have a different selling price with a three bedroom house in another place. It’s therefore important that have a rough estimate of the house that you are looking for in the location that you intend to live. West Chester PA is a small town with less population, low crime rate, no traffic, and quiet neighborhood and above all low cost of living. Buying a home in this town will make your life enjoyable because basic goods and services are readily available and very affordable. The Townes at Malvern is a new construction townhome community in Malvern PA to be built by Ryan Homes. As of right now no exact completion date is out or a total number of units to be built. The details are few but I will share all the info I could find. The plan is for Ryan Homes to offer 5 different styles of homes to chose from, ranging up to 2500 sq. ft. All the units will have a 1 car garage as well as a basement. The prices being advertised can be disregarded, I would not expect to sell many of these units sell for under $300,000. Also keep in mind it will have a hefty tax bill and a HOA payment. The homes are to be built in a very convenient location right off of RT 30 in Malvern. PLEASE remember NEVER to speak to the builder or builders agent directly. It is free for you as the buyer to use your own agent, that represents only you. 114 Shoreline Drive Downingtown PA is about to hit the market. This ranch home is located on Shoreline Drive in Upper Uwchlan Township in the award winning Downingtown Area School District. This home is nestled on a spacious 1 acre lot at the end of a cul-de-sac in a beautiful spot on Marsh Creek and has direct backyard views of the lake. A short walk down to the water to boat or fish would take only a few minutes. The home has been completely renovated from top to bottom. 2nd garage added, brand new exterior stucco, new roof, new kitchen the list goes on. The basement is the entire footprint of the home and has been completely finished and a full bath added with a small workshop and storage area. This area could easily be a 4th bedroom. Contact Drew Heasley at 610-761-1602 today to schedule a showing before it hits the market. Full pictures and video tour of 114 Shoreline Drive Downingtown PA 19335 will be posted shortly. Reserve at Chester Springs is a new construction single family home community coming to "Chester Springs". The community is off Little Conestoga in Eagle, Upper Uwchlan Township in the award winning Downingtown School District. Toll Brothers plans to build 61 single family homes on lots ranging from 1/4 to 1/2 acre. They will offer 5 different home designs, ranging from 3,100 sq. ft to 4,200 sq. ft.
Homes are close to the PA turnpike but its too early to tell if noise will be a factor. The homes could be ready as early as Fall of 2016, though no prices or specs have been released as of yet. Information is limited at the current time, but please email to stay in the loop. Please contact me before checking out the community. If you are in the market for a Phoenixville PA home, start your search here. Phoenixville offers a number of housing options under $250,000. Phoenixville PA homes for sale between $250,000 and $400,000 is our most popular search. Phoenixville offers a wide variety of luxury homes for sale. Phoenixville PA real estate has become more desirable every year. The land is going fast. The above homes all have over 1 acre of land in Phoenixville PA. If you are looking for more land give me a call at 610-761-1602. Phoenixville PA Homes for Sale with 4+ bedrooms are a hot commodity and usually go fast. Also for weekly contest and even more local Phoenixville PA real estate information check out our Facebook page. Pickering Crossing is a community by Southdown Homes in Malvern, PA.
Whatever you do, use a buyers agent that represents you the buyer. Do not use the builders agent under any circumstances. This only will ever benefit the builder. It is free to have me or many other local Realtors represent you and negotiate against the builder and builders agent. Pickering Crossing is an exquisite community developed by Southdown Homes’ in the region of Chester County. This community is located at the intersection of Charlestown Road and Route 29 in Malvern. Pickering Crossing has the advantage of being in proximity with everything you’ll need, including the Great Valley School District. Homeowners in Pickering Crossing enjoy easy access to the new Charlestown Turnpike ramp , which features the most significant corporate centers, health care centers, quality shopping, and major local employers in the region. Homeowners in the community Pickering Crossing also enjoy a low maintenance lifestyle, with easy access to every important amenities that make up the comfort of our modern living daily lives. The community is just few minutes away from major local corporations such as the Great Valley Corporate Center, the Vanguard Group Headquarters, the new Atwater Corporate Center, and Chesterbrook Corporate Center. Paoli Hospital, Immaculata College, and Penn State Valley are also only few minutes from the community of Pickering Crossing. King of Prussia mall, Uptown Worthington, home to Target and Wegman’s, are also is nearby. For those who like quaint small town shopping style, they will also find little stores on their taste in the borough of Malvern. Easy access from Pickering Crossing is possible to the Routes 29, 30, 202, and 401, as well as to Pennsylvania Turnpike. This community is not only convenient to Chester County, but also to Philadelphia and the Main Line. The community of Pickering Crossing features a total of 76 luxury carriage homes with pricing starting in the $400,000’s. The luxury carriage homes are between 2,500 and 3,100 square foot. Their open plan designs rear access to a 2-car garage. Models will be available with 3 or 4 bedrooms, a master bedroom on the first or second level, a third floor finished loft, 2.5 to 3.5 baths, a separate study, and dual master suites. Pickering Crossing home community was developed by a reputable builder in Chester County, Southdown Homes. You may research more about Chester County, Pa communities, Southdown Homes and Pickering Crossing by visiting the Web address www.southdownhomes.com. If you would be interested to buy a residential home in Pickering Crossing, Southdown Homes' delightful new community or just to invest in a home in the convenient Charlestown Township, Malvern, here is more useful information for you. Each of the 76 luxury Twin Homes and Carriage homes features 3 or 4 bedrooms, a 2 car garage with rear access, and 2-1/2 to 3-1/2 baths. This exquisite luxury community doesn’t miss plenty of charming features. Modern amenities and feature abound throughout, such as 9 foot ceilings on both floors, and spacious fireside gathering rooms. Some plans have a wraparound porch, a separate study room, two master suites, and a finished third floor loft. Pickering Crossing is located in the reputable Great Valley School District, at the intersection of Charlestown Road and Route 29. This is an ideal location close to shopping centers, good restaurants, and corporate centers, easy for commuting on major routes. Here all residents enjoy a low-maintenance and care free life. If you are interested to live there it would be a good idea to stop by the sales office and visit the community yourself. The sales office for homes in Pickering Crossing is open Thursday through Monday between the hours 11 in the morning and 5 in the afternoon. Pickering Crossing twin home development in Malvern, Pennsylvania, combines convenience and beauty to create the lifestyle in this perfect community for those who want a enjoy a low-maintenance yet luxurious lifestyle without the need to sacrifice quality. This is not your typical low maintenance homes community by any means. One of the things that Pickering Crossing offers but most other twin home communities do not offer is space. While in other developments you will find that most of the twin home units offers just less than 2,000 square feet and most often they do not have more than three bedrooms, in Pickering Crossing the units start at 2,600 square feet and, depending on the design plans and model, they may go all the way up to 3,100 square feet. Some of the home units in Pickering Crossing even include a loft space plus four bedrooms. Another advantage there is the fact that being a new development, each of the 76 home units in this community in Malvern, PA, is still brand new. So it is most likely that if you are planning to purchase a home in Pickering Crossing, you will be the first, and only, owner. A owner of a beautiful home located in a new neighborhood in high demand. As for today real estate multifamily market, it is really difficult to find something similar in other locations. When it comes about Pickering Crossing, this is sure to be a great and amazing development, and with prices of new homes for sale there starting at just $400,000, it is certain that these units will sell quickly. Therefore, if you think you would like to live or to invest there, make sure to not miss this great opportunity and ensure your chance to own one of these brand-new twin homes. The home interiors for these very large units by all standards are packed full of excellent features that you will usually not find in this price range. Actually, you will even find features typical only in some luxury homes: marble, tile, high ceilings, top-of-the line appliances and fixtures. These all are just a normal part of each brand new home in Pickering Crossing. Thanks to the open floor plan design of each home in the Pickering Crossing community, they are the ideal place for day to day living as well as for entertaining guests. The floor plans are well-designed, including features such as separate laundry rooms, first floor master suites, third floor loft spaces, open kitchens with islands, fireplaces, breakfast rooms and formal dining rooms, and large walk-in closets. If you want to see a unit in person, or you would like to discover more about this new, luxury twin home and luxury carriage homes development you can contact me directly at 610-761-1602. Applecross in Downingtown PA is a highly sought after community in Chester County Pennsylvania. 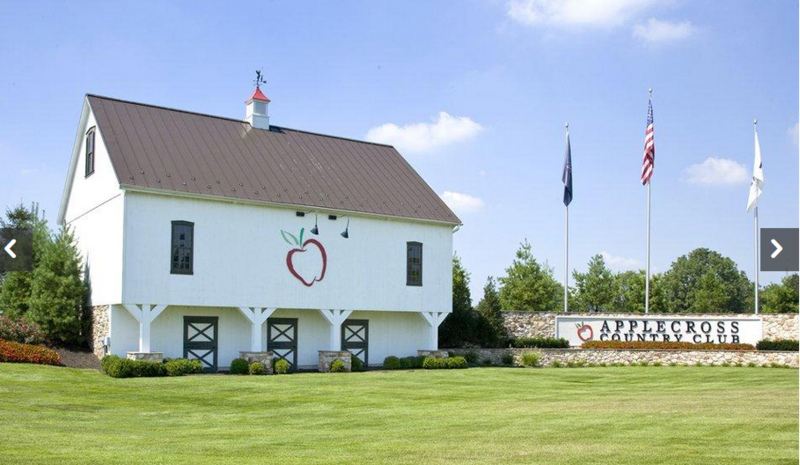 Applecross is located right off of 322 in the award winning Downingtown Area School District. Applecross offers a mix of single family homes and townhomes. Applecross currently has 5 homes for sale, with 5 under contract. Click here to see current homes for sale at Applecross in Downingtown PA. Homes in this community usually range anywhere from $300,000 to $600,000. Applecross in Downingtown PA offers a number of community features. This features are highlighted by an 18 hole Nicklaus designed golf course. The golf club house with restuarant, bar and pro shop are highly talked about by the residents of Applecross. Dont worry if you need to sharpen your skills they have an on site golf academy. Many homes in the community are positioned near the course creating an amazing living experience. The community also has a health and wellness center that is over 12,000 square feet. Other features include lighted tennis courts, indoor and outdoor pools and walking trails. Get an even better idea of what Applecross has to offer in this video. Laurel Ridge in West Chester PA is a new construction community located directly off Rt 100 in West Chester PA. Laurel Ridge will consist of 17 homes on half acre lots, being built by Glen M White Builders. The sign for Laurel Ridge West Chester PA is on Rt 100 and says that the homes will start from the high $500's. I would not expect to see too many sales in this community in the $500's, builder upgrades can add up real fast. Laurel Ridge will consist of 5 different different models to choose from with each model having 2 styles. This creates an opportunity for 10 different homes in a community of 17, so it shouldn't seem too cookie cutter. If you are interested in this community please whatever you do, do not call the builders agent for more information or to make an offer. This agent works for the builder, their loyalty lies with him and the hundreds of deals they bring to the table. You are a customer to this agent, not a client. It is free to you to have a buyers agent represent you in the transaction and look out solely for your best interests. I would be happy to help you with this or explain how these relationships work better. Also here is a short video on the builder. After searching the builder for a while, I can only find one homeowner who was not satisfied with his work. They currently have 5 homes listed on the MLS with the least expensive at $590,000 and the most expensive listed at $676,500. Keep in mind these are base prices. If you want to see these or any other homes check out my website atwww.searchchestercountyhomes.com. If you want more information or to tour the community give me a call at 610-761-1602. Update: Model home is complete, other homes are coming along fast.